New 31FT Full Cabin as part of our Yachtline. The aluminum has been ordered and will be complete Q1 of 2019! August was a hot one! So hot in fact we ordered a pair of the top of the line evaporative coolers to help the crews battle the heat while still keeping pace for busiest month to date. All of us in the Pacific Northwest also faced a continuing summer tread, weeks of forest fire generated smoke filling the air. The smoke not only created a stifling atmosphere but out on the water the visibility was so poor at times that you couldn’t see more than a mile! Challenging the smaller fishing boats on the water. For us, it gave us more of an opportunity to test the new radar units and chart plotters. One of the great new features we are sharing with our clients are the “auto guidance / routing” features now available in US waterways. Offered by both our OEM brands, Simrad & Garmin, with two simple clicks on the screen, your chartplotter can now provide you with a calculated, safe navigable route. Much like your cars navigation system. For those that also add autopiloting or Mercury’s JPO system, once the route has been generated, you can simply engage your autopilot and away you go. Now I know what you are thinking, while similar to the Tesla auto driving principle, boats do not have the sophisticated sensors to warn you and steer you around obstacles in the water, including other boats! So while it will generate a course, following the waypoints and warn you of AIS collision targets you will still have to be vigilant at the helm. The larger summer tides pull a lot of wood from the beaches, and they often get stuck current rips that form due to our ever changing underwater landscape. So why use these new features if they still require attention at the helm, well because they can also offer some safety features and they generate important information about your journey. Like your time to arrive, distance to your destination, and thus fuel consumption. As far as safety features, because they are auto-routing, they are generating waypoints that are located away from shallow water or underwater obstacles. When waypoints are manually entered we often enter fewer points because it takes too long. Well the auto-routing generates as many points as it needs to keep your route away from the dangerous underwater features. It will even notify you of hazards you may pass on our journey. Like channel buoys or harbors. To add auto-routing for either charting brands, all you need is the latest software updates and Platinum charts. At the rigging shop we finished the second 31FT GT Coupe and continued work on a 29FT Full Cabin, 18FT RIB, 21FT Center Console, and the 40FT Dive Boat for Maui. In August we attended the Maritime Security conference in San Diego. This conference is held twice a year. In the late summer/ fall on the west coast and in the spring on the east coast. We were asked to present at the show on innovative technologies we are working on and what trends we are seeing in the industry. With so many clients out on the water this year we had lots of great stories to share. 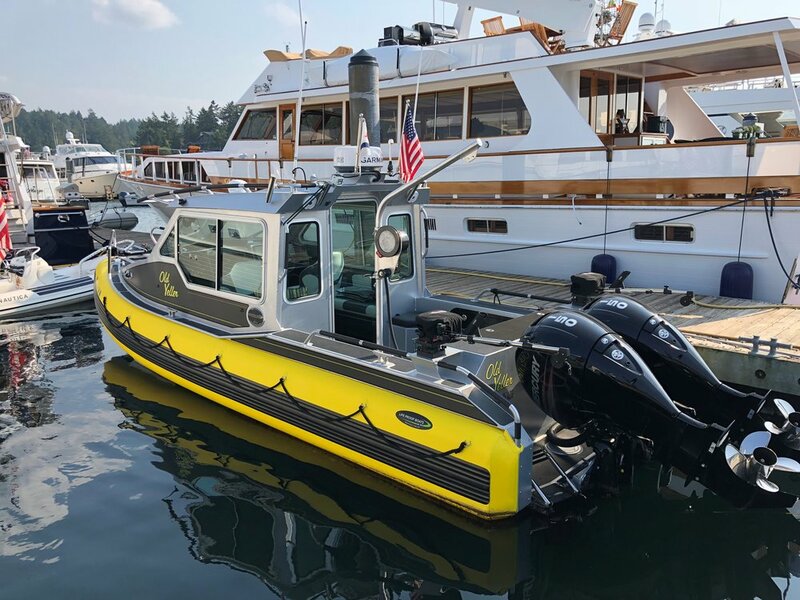 The Falcon Patrol become a fishing catching machine in the Puget sound. This first time boat owner, absolutely loved the control and usability the Mercury JPO system gave him. He can back his boat into his narrow slip with ease! We also heard from a few boats that headed north seeking adventure. At only a 3.5hr run we had client go from Roache to Cortez Island. He loves the speed at which he can travel comfortably, making day trips out of slower weekend trips in his old boat. In “Flirtn’ with Disaster” a 29FT Hardtop, our client shared from Lund it only took then 1:45 to get all the way up to Chatterbox Falls. Something we could never had done before. Even the recently delivered Side Targa blew the clients away for how comfortable the boat was. They adventured all summer and spent 11 overnight trips up in Desolation Sound. Our boats are designed for safety, versatility, and adventure. Our clients are out on them and finding out exactly what we talk about. Come see us at the Lake Union Boats - Afloat in September and learn more!